NEW: Bush touts "52 months of uninterrupted job growth"
WASHINGTON (CNN) -- President Bush admitted mistakes but defended his accomplishments in the final White House news conference of his presidency Monday. 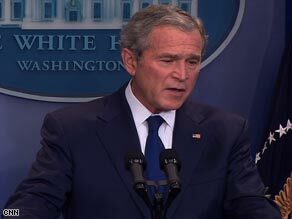 President Bush addresses reporters at the White House on Monday in his final news conference. Admitting another mistake, Bush said that he should have pursued a comprehensive immigration overhaul after the 2004 election, instead of Social Security reform. He said that Congress did not have the political willpower to tackle Social Security at the time because the program was not facing an "imminent" funding crisis. But Bush said plenty went right during his eight years in office, including the economy for most of his term. "I inherited a recession, I'm ending on a recession. In the meantime, there were 52 months of uninterrupted job growth," he said. What happens after the White House? President Bush and Laura tell Larry King. "And I defended tax cuts when I campaigned, I helped implement tax cuts when I was president, and I will defend them after my presidency as the right course of action." iReport.com: How will you remember Bush? "Don't tell me the federal response was slow when there was 30,000 people pulled off roofs right after the storm passed," he said Monday. "Could things have been done better? Absolutely. Absolutely. But when I hear people say the federal response was slow, then what are they going to say to those chopper drivers or the 30,000 that got pulled off the roofs?" he asked. Bush was steadfast that his administration did the right things in protecting the homeland from terrorists, even though critics said individual freedoms were compromised by administration policies. iReport.com: How will you remember Bush? "In terms of the decisions that I had made to protect the homeland, I wouldn't worry about popularity. What I would worry about is the Constitution of the United States and putting plans in place that make it easier to find out what the enemy is thinking," he said. The 43rd president says he doesn't buy allegations that America's image overseas has been tarnished during his terms, even if his popularity has suffered. "My view is that most people around the world, they respect America. And some of them don't like me -- I understand that -- some of the writers and the, you know, opiners and all that. That's fine. That's part of the deal. But I'm more concerned about the country and -- and how people view the United States of America. They view us as strong, compassionate people who care deeply about the universality of freedom." "I just can't envision myself, you know, the big straw hat and a Hawaiian shirt sitting on some beach," he said.